In this episode/movie, we offer initial thoughts on the tri. episode/movie series as a whole and hopefully sort out this whole episode/movie alternate dimension business. 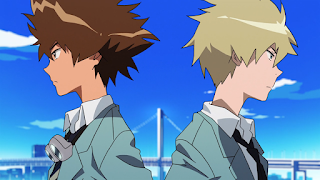 Last year, we were treated to the bombshell that the newest Digimon anime would be a continuation of the Adventure series, starring our beloved season one kids in high school. As amazing as this sounds, this was not a guaranteed slam dunk. It both invites and threatens years of fan theories and expectations, which is as much a part of any media experience as what we actually see. It's in the uncomfortable position of honoring the shaky continuity of a fourteen-year-old series that not everyone is going to recall accurately and many fans didn't even like. It has to reconcile the color and style of a turn-of-the-century anime with that of today's shows without losing the feel of the original. It also has to overcome what is perceived to be a production delay of half a year, a change in format, and a failure to give any clues as to an international distribution until a day before its release. Nervous yet? This isn't the first time Digimon has tried to reach out to older fans with a new series and an updated style. The objective with tri. isn't all that different from the objective with Savers. While Savers was a great series (better than Adventure, in fact), it didn't do its predecessors justice. It kept the fundamental human-Digimon partnership and did everything else completely differently. It worked on its own, but as a part of the franchise it feels detached from everything else. While tri. is bringing a degree of maturity, the mere presence of the original cast locks us in. Of course, this comes at the risk of scaring off new viewers unfamiliar with the old timeline. The timeline is an issue all to itself. Our original objections to the epilogue are now front and center, as it not only interferes with our imaginations, it now drives the way tri. has to tell its story, imposing restraints that shouldn't have to exist. For our purposes, 2027 is a fixed point in time, a static and inevitable fate that can't be corrupted. Now any Doctor Who fan knows that if the writers absolutely need to, heaven and earth can be moved to alter inconvenient fixed points. Lord knows there are enough dimension benders in the franchise. But it's unlikely, and comes with its own host of problems. Odds are, tri. has to be written knowing that we've all read the last page of the book. Besides, while the epilogue itself is an annoying hindrance, the actual content isn't. For a story taking place with the kids in high school, most of the specific things we nitpicked aren't relevant. Others are either petty objections we can swiftly dismiss or elements that tri. can properly explore. Half the problem was that we all had questions about how the real world would react to an increasingly public Digital World. Now it looks like we'll get to see this actually play out. That's why, despite the concerns, it's easy to be optimistic about tri. While the timeline is thick with details and may be hard to recall, it also means an enriched, built-in world that we can leap straight into. And no season has yet to match the diversity, depth and relatability that the Adventure cast provides top to bottom. It's not enough that we want to see one or two stars again. We want to catch up with all eight of them. We want to see them interact. We want to see how they're growing. So... remember when they took three movies and fused them into one over here? In a weird case of reverse osmosis, each movie in the series ships divided into episodes. These don't actually have the individual structure, plot or action to work as episodes. Thing is- the first movie as a whole doesn't have that either. It's clearly part one of a larger project. That's why we will be taking on each of the first four episodes individually. They will be graded as such, allowing of course for what they are and not docking points for a weak second act or anything like that. We've always been more about the analysis than the grades anyway, and this gives us four times as much space to talk about it. We're gonna need it. What better way to start things off than with a beautifully appropriate new version of the original song? It seems more nuanced and more mature, like the song itself has aged with the times. It brings out the bittersweet lyrics, possibly even more meaningful now than they were fifteen years ago. And another thing! 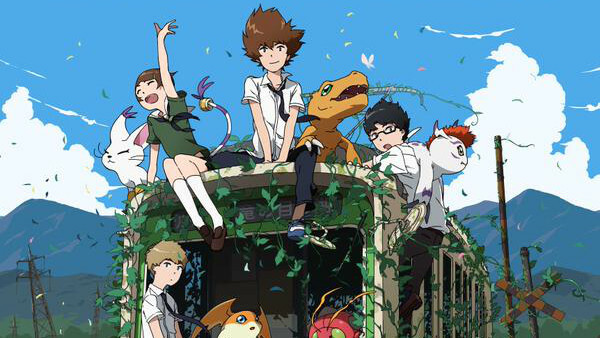 Fans of Digimon movie analysis will do well to check out the Lost in Translationmon podcast this weekend as they break down the Our War Game movie. And Summer Wars, because that's just what you do when you break down Our War Game... we sure as hell did. I mention this because I made a very... unique contribution to this episode. You'll see what I mean. Labels: adventure, movie, not an episode, opening, tri. I think Butterfly's lyrics are even more appropriate now, that they went back after the Reboot.